The President of the Entertainment Software Association said the Supreme Court's decision is a total victory for the game industry. Parents groups may be complaining about the Supreme Court's decision to strike down the California statue limiting sales of violently deviant games to minors, but Michael D. Gallagher of the ESA says that's not the case at all. 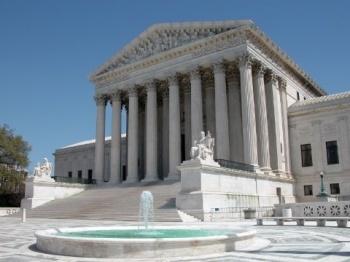 He and Paul Smith, the attorney who argued for the game industry in the Supreme Court back in November, said that today's decision will not be quickly overturned that, despite some dissenting opinions in the court, the industry is safe from legal scrutiny for at least a few decades. "For consumers and parents, it's a very bright day," Gallagher said. "For parents, the Court's decision very clearly states that they are to be in control - not the state - for the content that is consumed in their homes." Paul Smith expertly argued this case before the Justices themselves back in November 2010, and he sees the decision as a complete win. "You seldom, if ever, see such a strong, clear and sweeping decision from the Supreme Court the first time they get into an issue," he said. "This decision constitutes a categorical rejection of regulation of videogames based on their content." Smith said that the Supreme Court considered the science of the studies which claim that videogames were harmful and rejected that notion as well. "The very people who claimed to have shown something significant about videogames acknowledged when they were under oath that they didn't think [games] were any different in their effects than Saturday morning cartoons, an area which the State chose not to regulate." What about the opinion of Justice Alito and Chief Justice Roberts, which seemed to leave the door open for future legislation? Smith didn't think was going to happen anytime soon. "The Court does not overrule itself very regularly," he said. "The quickest you see is decades at a time so I don't think that that's very likely going to happen in the near future." Smith also noted that Alito and Roberts didn't really give any guidelines for how such a law might be effectively worded. "It's my view, having worked on these cases for a decade, that it's not possible, using the tools of the English language, to write a law that separates out permissible versus impermissible violence for minors that would have anywhere near the clarity that is required under the First Amendment." Gallagher elaborated by pointing out why we shouldn't be quibbling about the dissenting views. "The majority opinion is the unquestioned law of the land," he said. "Just because [Alito and Roberts say] it's possible to do something, that doesn't mean it's wise to do it." The State of California spent six years and close to a million dollars in legal expenses to argue that the proposed law was legal in this country. Given the huge cost that the taxpayers of California have already paid in trying to get this law enacted, it's important that this decision be considered final. But I wondered if Alito and Roberts somehow kept the door open for more States to try to pass new laws that might meet the standards of the Constitution. "Any State that passes a bill that tries to regulate videogames based on content is just asking to pay my legal fees, in the long run," Smith said. Gallagher said that his definitive answer is: "No, that door has been slammed shut."